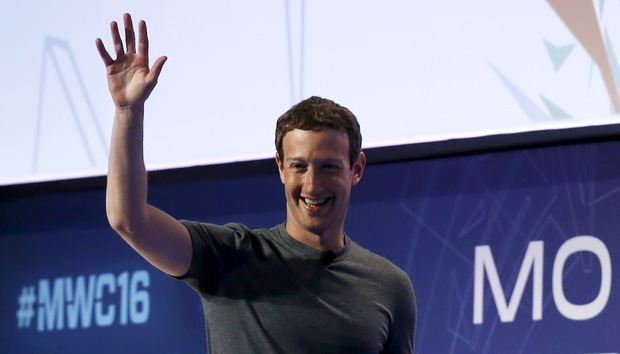 Facebook CEO Mark Zuckerberg made the trip this week to Barcelona for Mobile World Congress 2016 for the third year in a row. Following his surprise appearance the previous evening during a Samsung presentation, where the exec focused on VR, Zuckerberg downplayed mobile carriers' fears about the Facebook's motivations for global connectivity, detailed his vision for the future of online video and voiced sympathy for Apple in its ongoing legal battle with the FBI. Zuckerberg also criticized the mobile telecommunications industry for positioning 5G, the next generation of wireless technology, as a tool to connect the Internet of Things (IoT). Expanding network capacity for IoT is important, he said, but people should come first. "It's kind of crazy that we're sitting here in 2016 and four billion people in the world don't have access to the Internet," he said at the start of his keynote yesteday. "It would be possible for this industry to continue growing and making a lot of money while doubling down on faster connections for rich people. What I personally hope is that we don't just do that, but also finish the job of making sure that everyone in the world gets Internet access." Internet.org, an initiative that includes Facebook's various efforts to make Internet connectivity more widely available, came under fire as of late. Earlier this month, telecom regulators in India banned the company's Free Basics program, which gives people in developing countries no-cost access to online basics, including Facebook.com, and forced it to halt its rollout in the country due to potential net neutrality violations. Zuckerberg called the ban "disappointing for the mission" but said Facebook understands the same models won't work in every country. "We've continued rolling out Free Basics in other countries" and "in India, we're going to focus on different programs," he said. "In the first year and a half, [Free Basics] has helped 19 million people get on the Internet that haven't had Internet before. Facebook isn't a company that hits a roadblock and then gives up." Free Basics, which is currently available in 38 countries, is Facebook's first Internet.org program, and it's currently working to develop solar-powered planes, satellites and lasers that can beam Internet access from 60,000 feet to remote or otherwise unconnected regions around the world. Zuckerberg downplayed the ongoing tensions between his company and the major cellular network operators. "While there might be tension in any relationship, I think this is a much more symbiotic one than a tense one," he said. "Our apps and the other apps that folks are building are driving a lot of the demand for what people want to consume on networks. Consumers don't pay to use Facebook, they pay for the data they're consuming through operators." Thomas Husson, a vice president with Forrester Research, says Zuckerberg's comments fall short for the leader of a company that owns the largest mobile audience in the world. "Facebook has always had a love-hate relationship with carriers and this tension will accelerate now that the time has come to connect the next billion of Internet users in emerging countries," Husson says. Facebook users don't pay any membership fees to use the social network, but they do pay for the data they use to access it, and the company built a massive advertising business that drove $5.6 billion in revenue during the fourth quarter of 2015 on the backs of these users and their networks. "Many telcos see no reason why they would have invested so much in the infrastructure to let Facebook benefit from it without paying anything," Husson said. "Not to mention the risk of damaging their core business with the likes of WhatsApp killing their SMS cash cow." Zuckerberg said making money isn't always Facebook's priority, particularly with respect to getting people online. "We actually don't want to have any business success that people would think we're misaligned with them on until everyone else is making money first," he said. "Having a for-profit company is a good way to make a change in the world. But that doesn't mean that just because you have a company you don't primarily care about the mission and the people that you're serving and how you can make their lives better." Online video helps Facebook prepare for its mission to expand across the globe, according to Zuckerberg, who says video will represent the vast majority of online content people consume in just a few years.. "I think that video in 2016 is probably as big of a shift in the way that people are going to share and consume what's going on in the world around them as mobile was for how people shared in 2012 or 2011," he said. The pervasiveness of live video also changes the dynamics of social sharing, according to Zuckerberg. "[Live video] gives people more intimate environments and more raw environments where you have a reason to just be yourself," he said. "You can just share what's you — it doesn't need to feel like it's super curated." Finally, Zuckerberg shared his thoughts on Apple's ongoing legal battle with the FBI over the government's request for a "backdoor" into the iPhone of one of the accused terrorists behind last year's mass shootings in San Bernardino, Calif. Apple refused a judge's order and effectively dug its heels in for a battle in federal court, as well as the court of public opinion. "We're sympathetic with Apple on this one," Zuckerberg said. "We believe in encryption. I don't think requiring backdoors into encryption is either going to be an effective way to increase security or is really the right thing to do for the direction the world is going in." He called encryption an important tool that should not be banned in mainstream products, but said also Facebook will cooperate with government agencies on other matters. "We feel like we have a pretty big responsibility, running this big network and community, to help prevent terrorism," Zuckerberg said. "If we have opportunities to basically work with government folks to make sure there aren't terrorist attacks then we're obviously going to take those opportunities."